I'm glad that Brocade Home recently launched a new collection called Petit Boudoir targeting all the little girls out there that want mommy to turn their bedroom into a plush pad fit for a princess. If I could turn back time and be 12 again, I'd be begging my mother to buy me some of this stuff, it's simply adorable in every girly way possible. Of course, Brocade Home has their collection for the bigger girls too (the rest of us) and these are my fave four from their Fall line. 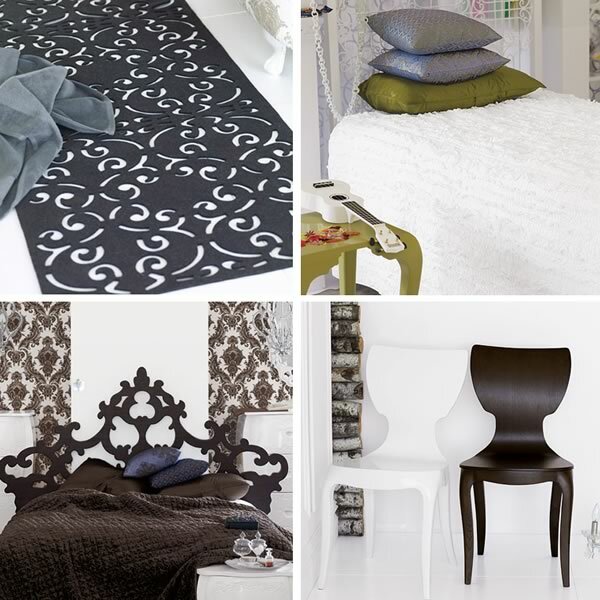 Most of BH stuff is too large and ornate for my home (the architecture of my place would not welcome the baroque look at all), but I do adore their laser cut headboards because they look a little fantasy-like and remind me of Swedish designer Myrica Bergqvist. I also really like their ribbon duvet, it's charming (I love texture), the bent wood chairs, and the laser cut felt rugs. Felt rugs are extremely nice to have around in the Autumn and Winter, I'm attracted to the cut out designs and the visible fibers, so tactile and dimensional, something about them look earthy but also very fashion forward. I have to ask this, has anyone out there shopped Brocade Home yet? I keep wondering how they 're staying afloat because I don't hear much web chatter about them. Maybe many of us prefer to see furniture in person first before we buy it? I didn't shop Anthropologie, DWR, or West Elm online until I started visiting their stores. Now that I know their quality and the various labels they carry, I feel confident shopping from home without ever stepping foot in their stores again. But I did need to visit them in person first. I don't care about small things, like what I find on Etsy or books and such, but when it comes to larger furniture (beds, sofas), I prefer seeing it first in person because I just don't trust most of what's out there today. If it's an antique or a vintage piece and I know the name, I will buy it online (and have, like my bertoia chair that I've had for years and my Swedish sideboard)... Any thoughts on this that you care to share?